Top athletes from MMU’s sports teams met with some of MMU’s aspiring journalists in a ‘journalism masterclass’. 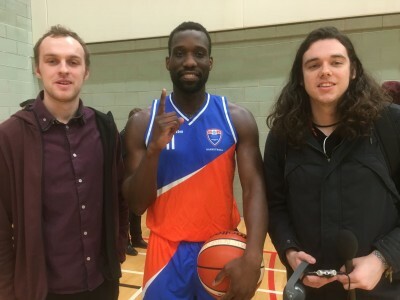 MMU’s first Journalism Masterclass brought together the university’s top sports performers to show off their skills to an audience of multi-media journalists who took photos and videos and then conducted radio, online and TV interviews. There was a dramatic display of basketball skills by scholars Loick Pouale and Tyme Regent-Bascombe, a demonstration of lacrosse and the chance to meet top karate scholar Amber Sawford. Hive Live Sport presenters Sam Richards and Harry Freebre interviewed all the athletes for their Wednesday afternoon sports show. The MMU water polo team has had a particularly successful year, winning their league title in their first year, and now have a BUCS National semi-final clash with Cardiff this coming Wednesday (22nd) MMU sports performance manager and water polo coach Jerome Read told Sam he is confident his team will perform well. “Durham have won it for the last two years, but we’ve got belief and no fear,” he said. 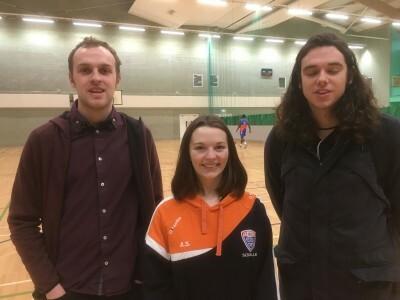 MMU Sport communications coordinator Ellie Caddick was on hand to advise potential reporters how to cover games for MMU outlets using the hashtag #MMUSport. Two first year journalists Raidraig Curran and Callum McLeod will be covering next Wednesday’s finals for Hive Live Sport and MMU Sport. The editors of all MMU editorial outlets – Humanity Hallows, Northern Quota and our new podcast ‘The Quote’ – were all at the Masterclass to give tips to mobile journalists and film-makers. Multimedia Journalism lecturer Vince Hunt, who organised the event, said: “The aim of the Journalism Masterclass is to bring together our outstanding MMU athletes with our journalists in a practical demonstration of how to cover sport in today’s multi-media environment. Hive Live Sport covers all MMU Sports activities, including reports on golf, women’s rugby, hockey, badminton, taekwondo, boxing, netball, squash and basketball. If you’d like to report on MMU Sport contact Ellie Caddick or the Hive Live Sport team.